Crackers are a staple when it comes to snacks and hors d’oeuvres. You can eat them with cheese, hummus, peanut or almond butter, dips, and deli meats. They make a great addition to lunch boxes, they pack well on a hike, and a handful will tide you over when dinner’s still half an hour away. On the other hand, homemade crackers will dress up your table and instantly add elegance to your appetizer tray. And the best thing? They’re so easy to make! These Rosemary crackers are gluten free and can be made vegan, but they are full of flavor and crunch. The recipe comes from one I found at the Fork and Beans blog, with a few slight alterations. You will be surprised at how fast these crackers can be put together…speedy enough to make when an unexpected dinner invitation arrives, but pretty enough to take center stage with a wedge of Brie or a bowl of hummus. If you’d like, double or triple the recipe and make extra crackers for later! I used a food processor to make the process a little easier. First, combine some gluten free flour (use your favorite mix), some ground organic flax meal, sea salt and rosemary leaves and pulse a few times to blend. Then, add a few tablespoons of organic butter or coconut oil. Pulse again until the mixture is crumbly, as if you were making pie crust. You can do this by hand, too…just cut the butter or coconut oil into the flour mixture with a fork or pastry cutter.Once you’ve got crumbs, slowly drizzle a bit of water into the mixture as you continue to pulse it in the food processor (or, mix in some water a tablespoon at a time as you blend the dough with a fork). You want a dough that will look crumbly, but will pack together and become more pliable when you work it with your hands. Cut two sheets of parchment paper to fit your baking pan, and form a ball with the dough. Roll it between the two pieces of parchment paper, the thinner you roll it the crunchier the crackers will be. Cut them into the shapes you’d like, either with a pizza cutter or with a cookie cutter. I like to cut mine with a pizza cutter, because I like the rustic uneven look and it makes it easier to transfer them to the baking sheet…just lift the parchment with the crackers on it and place it on the pan! Sprinkle the crackers with sea salt and bake them for 10-12 minutes, or until the edges start to brown. Once the crackers are cool, snap them apart and serve…or put them in an airtight container and store them for later. They will keep on the shelf for quite a while, or if you’re worried about them getting stale you can freeze them. Crackers are really so easy to make! Who doesn't love crackers? 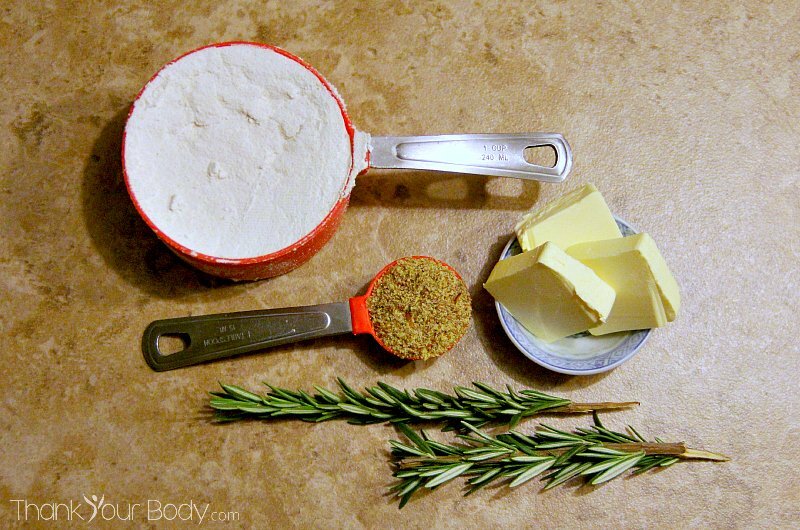 Well now you can make your own Gluten Free Rosemary crackers that are the perfect snack! In a food processor, pulse together the dry ingredients to blend. Or, blend them together by hand in a bowl. Add the butter or coconut oil, a little at a time, and continue to pulse until crumbs form. Or, cut the butter or coconut oil into the flour using a fork or pastry cutter. Add the water a bit at a time, pulsing until the dough starts to form a ball or stir the water in with a fork. You want the mixture to be somewhat dry, but form a pliable ball when you pack it with your hands. Pack the dough into a ball. Cut two sheets of parchment paper to the size of your baking pan. Roll the dough out between the paper, the thinner you roll it the crispier the cracker will be. Cut the crackers with a pizza cutter or with a cookie cutter, and sprinkle them with sea salt. Transfer the paper and crackers to a baking sheet. Bake for 10-12 minutes, or until the crackers brown around the edges. Let them cool, then snap them apart (if you used a pizza cutter) and serve or store in an airtight container. What’s your favorite kind of cracker?